Buying an air conditioner for your home is a big financial investment. Besides the cost though, you want to make sure you are getting a unit from a reputable company that treats you fairly and installs it properly (and legally). 1) The Energy Star Label. Check with the vendor to see if they sell ENERGY STAR qualified products. These qualified products meet strict energy efficiency guidelines set by the U.S. Environmental Protection Agency and offer significant long-term energy cost savings. Be sure to have your vendor show you the calculations of savings your home will receive from ENERGY STAR AC equipment. 2) Itemized Estimates. When comparing vendors, consumers should request detailed, itemized estimates. This way you can compare “apples to apples”. These itemized estimates should include details such as energy efficiencies, warranties, model numbers and delivery times. While one estimate may look a lot less then another, the installation time and energy efficiency maybe completely different which could make it much more costly in the long run. 3) Licensed, Insurance, Certifications. In many instances, air conditioning and heating vendors claim to be licensed and insured but in reality they aren’t. Why is a license important you may ask? A licensed AC vendor is licensed to manipulate gas lines and electrical applications. The last thing you want is someone who doesn’t have the proper training installing an item like an AC that could potentially mess up your gas line or not properly dispose of refrigerant. Plus, if they aren’t insured you run the risk of having to deal with financial issues should a problem arise. A licensed vendor should have their license number clearly marked on all their marketing material. If there is any question you can always look them up on the contractors state license board. It’s also a good practice to check their rating with the BBB (Better Business Bureau) and any additional certifications such as NATE (North American Technical Excellence). NATE is a voluntary certification, which promotes excellence in the installation and servicing of heating, ventilation, air conditioning, and refrigeration (HVAC/R). 4) Check Referrals. If you aren’t personally referred to your vendor by someone you know, check online on various review sources such as Facebook, Google+, and Good AC Guy to see what others are saying about the potential company you are about to hire. If there are a ton of negative comments and very few positive ones, you may want to think twice before hiring that company. It could just lead to a big headache in the long run. In addition, reviews that are 100% positive may be a red flag too as most reputable companies may have a few mediocre reviews mixed in. 5) Ask for a Free Inspection. 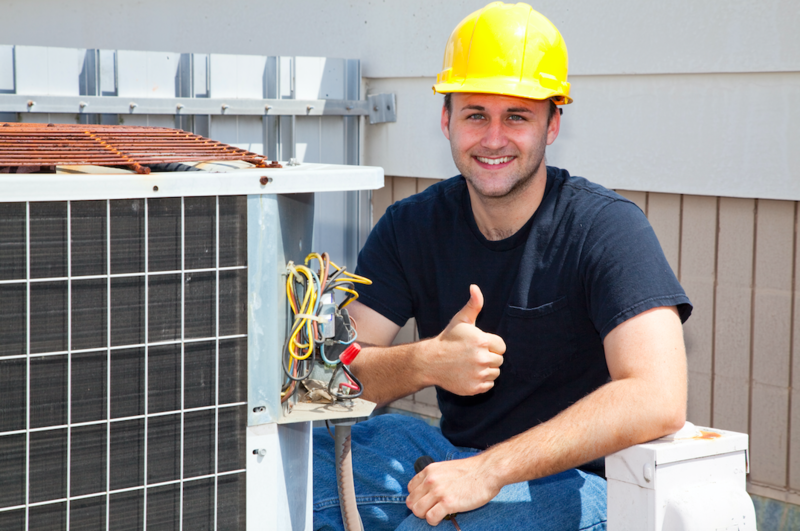 Before you let anyone sell you anything, always have an A/C vendor inspect your current system, before providing an estimate on a new system or repairs to the current system. When that vendor does arrive, make sure they look for air leaks, measure airflow and inspect insulation. This way their estimate is completely accurate and not based off assumption. The ACCA is a good resource to get more information on finding the ideal air conditioning and heating vendor as well looking out for your best interests. This free video will provide a full explanation on how to choose the right vendor to install your A/C system.